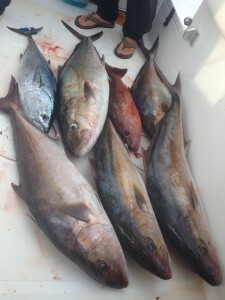 Gulf and near-shore fishing has been great lately especially if you can catch a day with a North wind. 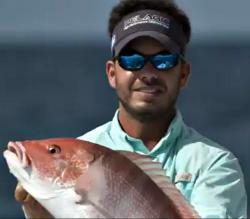 Big schools of Redfish are stacked off the bars East from the Destin pass. You can have all the fun you want using fluke style swim baits on jig heads. Live bait will also work but its a lot more fun on artificial! Amberjack have been my go to lately. They are just too easy to target this time of year. We have still been using the butterfly jig method and it seems to be working the best. You can also weed out the smaller fish by upping the jig to a 6,7 or even 9 oz jig. Remember to beef up your tackle especially if fishing over steel structure. You will want something with stopping power – at least 20-25 lbs of drag for the bigger fish. Of course, ALL the reef species are there if you want to have some fun catching and releasing. Snapper are thick as well as trigger fish. Frozen cigar minnows (AKA “Cig-Cicles”) will work but live shrimp is better. Capt. Preston's Grandad, Jack-Jack, gave him his first fishing pole at age 6 - he was HOOKED and never looked back! If he's not on the beach with his wife, Hadley he's out fishing in the Gulf off Destin, Florida. His early years were spent fishing the Everglades but his passion brought him to the panhandle where he's devloped a vast knowledge of the ins & outs of saltwater fishing. He's got a thirst for bringing others closer to this incredible sport and specializes in catching big fish on really light tackle. 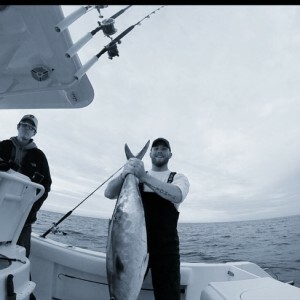 He likes to "get to know the fish" and deliver an exceptional fishing experience! Thanks for the report. I’m spending more time at our place in Bon Secour, AL, and am interested in trying to figure out the AJ and triggers this time of year. Jan. fishing was very good this yr. Question, never tried the beach, wanted to ask if it be productive in the colder weather, using any kind of bait, or a waist time.